Who doesn’t love cracking open and eating a fortune cookie after a savory Chinese meal? It provides a light dessert and a smallish paper crystal ball as a mini bonus. But many people don’t realize the importance (I use this term loosely) of asking for one more cookie than the count of your dinner party. Why is this so important? 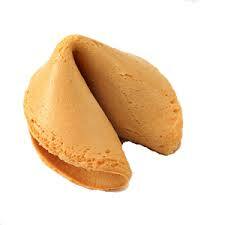 Because if the number of fortune cookies are equal to the number of diners, the last person getting a cookie has their proverbial destiny determined by the other cookie grabbers. Having one extra still leaves the slow grabbing, remaining sole a choice for their cookie. Hence, their destiny not left in the hands of the other individuals. So next time you are at a Chinese restaurant and the cookies are provided, make sure there is at least one extra. If there isn’t, you may just be leaving your destiny in the hands of the crumbling solitary cookie.